Successfully Added Pro - Undetectable HD Watch (Waterproof, 8GB) to your Shopping Cart. High resolution pinhole lens, waterproof construction, and stylish design make this new watch an excellent choice for all your needs. 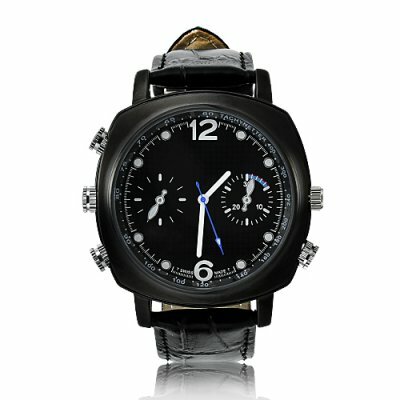 This attractive watch works and looks just like a high-class wrist watch, but hidden within is an HD pinhole camera. This makes it easy to take high quality undercover videos without worry that anyone will ever know. Place it on your nightstand, bookshelf or wear it to your next secret business meeting- the possibilities endless. With the press of a single button you will always be ready to capture high quality 1280x720 hidden videos within a moment’s notice. Simply press the RECORD button once to record, and then press it again to stop and save. The video and audio recording is then saved to the internal 8GB memory in user friendly .AVI files for easy playback on your computer. Yes. To record clear audio the closer you are to the subject the better. Works great for interviews, and records best within a range of 3 meters. When used underwater or with the underwater microphone cap this device will not record audio.